Who Is JAL Mileage Bank Good For? 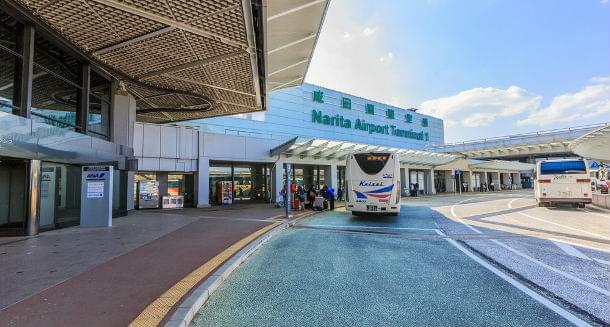 Asian award programs are largely underutilized by North American travelers, in no small part because of the difficulty of finding English-language (or even easily translatable) information on the program, and JAL is no exception. But with the changes in other oneworld partners, JAL has quickly become the best and in some cases the only place to turn for certain awards. As part of its continuing transition to the New American, American Airlines abruptly discontinued its oneworld explorer awards, which allowed intrepid travelers to hop around pretty much anywhere they wanted to in the world, with an impressive number of stops for a minor amount of miles. Japan Airlines, coincidentally, started allowing one-way and open-jaw awards right around the same time (they already had the distance-based awards and high number of stopovers available), opening up the airline to be the new home for exceptional oneworld itineraries. The one snafu is that Japan Airlines miles are difficult to accrue, and the airline only partners with one transfer program, Starwood Preferred Guest. But if you are or would like to be an SPG member, JAL Mileage Bank may be the perfect one-stop-shopping destination for your oneworld itineraries. How Can You Use JAL Mileage Bank Miles? Japan Airlines like many airlines in an alliance uses one award chart for its own flights and another chart for oneworld alliance partners. The oneworld chart operates on a distance-based zone system, with slightly unusual divisions. You can typically have one less stopover than the zone number, i.e., two stopovers for zone three, seven stopovers for zone eight, etc. If you need to go to Japan or elsewhere in Asia that JAL flies, you can get great deals using the JAL award chart, which offers round-trip award seats at redemptions more akin to one-way awards on many airlines. From the U.S. to Japan, award seats begin at 50,000 miles for round-trip in economy, 65,000 for premium economy, 100,000 for business class and 140,000 for first class. In addition to the massive, multistop oneworld award possibilities, Japan Airlines also offers a very solid first class and business class product of its own on flights from Chicago, London, Los Angeles, New York and Paris to Tokyo. 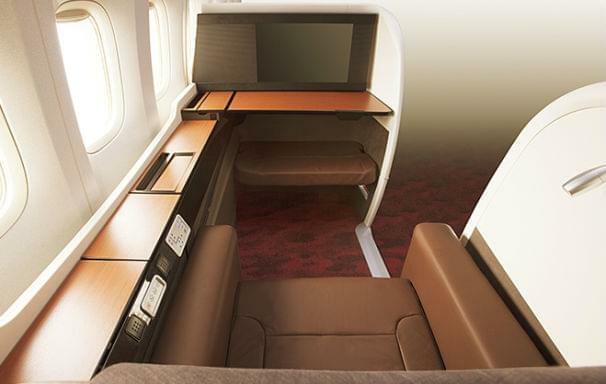 First class seats are fully private suites, while business class is semiprivate staggered seating. The real highlight is that JAL is very good about releasing award seats in these cabins (unlike many airlines), when seats first open and also when it’s close to departure, even for multiple seats together. While these awards will carry some fees (typically a couple hundred dollars round-trip), the low number of miles needed round-trip 80,000 for business and 110,000 for first class makes JAL a great way to get to Asia. JAL also used to be the best way to book premium cabin Emirates flights, but their fees now make Alaska Airlines a better option. If you don’t use Alaska, though, JAL is worth a look. Ironically, some of Japan Airlines worst awards are in Japan, because an overly complex award chart, which breaks the country into three zones, pegs even brief domestic flights at nearly 10,000 each way. Tickets booked in the J, C, D, X, W, Y, E, B, H and K fare categories are eligible for upgrades, which can be used for round-trip or one-way travel. Dates and number of seats available for upgrade awards are restricted. The number of miles required for upgrades is consistent, regardless of what fare class you originally booked in, but it is not cheap. Upgrading to business from economy runs 50,000 miles to Japan and 55,000 or 60,000 to other areas of Asia, depending on the destination. 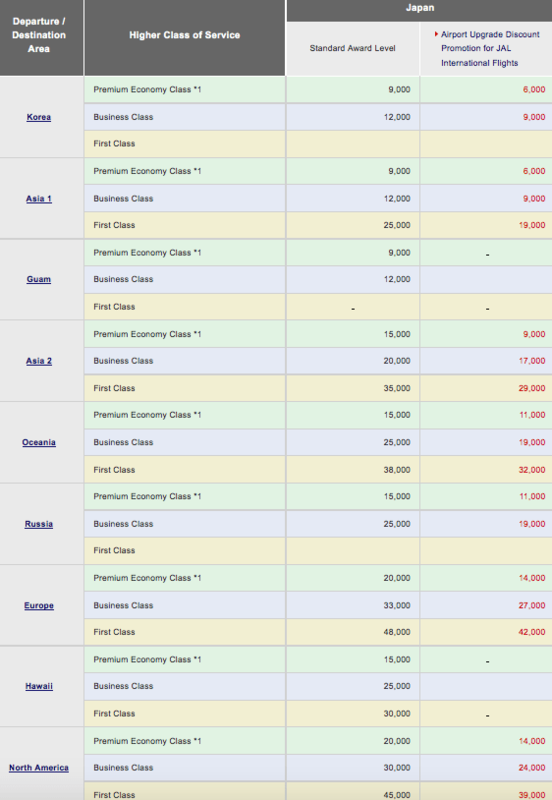 Japan Airlines actually offers two separate but parallel elite programs: JAL Global Club and JAL Mileage Bank status. In the Mileage Bank status levels, certain perks are available one week after status qualification, while others are not available until two months after qualification or April 1 the year after qualification. Each subsequent level includes the perks of the previous level, unless otherwise stated. Status members can also exchange miles for lounge passes at a rate of 1,000 miles per domestic lounge pass for Crystal members. Members at Sapphire level and above had lounge access for themselves and a companion and can purchase access for a third and forth companion at 2,000 miles each. JAL Mileage Bank members eligible for Sapphire or Diamond levels may be invited to the Global Club, which entitles members to gifts and use of additional exclusive lounges at airports and hotels. There are several other Japan Airlines cobranded credit cards available in Japan, but in the U.S., options are restricted to the JAL USA card. As it’s intended for recent immigrants from Japan who have not established a credit history in America, the card is far more fee-heavy than bonus-friendly. There are two reward levels, basic rewards and premium rewards. The basic rewards program offers one mile per $2 spent on the card and comes with a $20 annual fee, while the premium rewards program has a $50 upgrade fee that allows you to earn one mile per dollar spent on the card. There is no sign-on bonus, though there is an occasional 4,000-mile bonus available, but you earn a 5,000 miles bonus when the primary cardholder takes an international flight on JAL that credits to their Mileage Bank account. A 10 percent miles bonus is awarded while the card is held.